For those choristers who don’t feel fully confident reading music yet, practicing by yourself at home can feel much more difficult. If you don’t have a piano, it can be hard to pick the notes out on another instrument as well. This is why acapella practice can be so helpful, and it’s why learning solfege is so helpful. By singing your line by yourself without the aid of another instrument, you can begin to feel more confident about the way the note relate to one another, instead of trying to pick them out from the accompaniment. There are so many apps and websites now that feature recordings that it can quite easy to find a version of the piece you’re trying to practice. Singing your line against a full choir recording can be an excellent way to improve your musicianship as well! Here’s a tip – if you lose your line, don’t stop the recording and start again. Instead, try and follow along in the music, until you can pick out your line again – this way you’ll get in some ear training too! If you can’t find a recording online, you can always ask your choir conductor if you could record at rehearsal so that you can take it home for practice. Many choirs create such recordings to aid in at-home practice as well! This is one of the easier aspects of practicing by yourself at home, since it can be completely silent. Many choirs want choristers to memorize their music, so that the performers can be more responsive, and musical at a concert. There are many different techniques to help you memorize your music more effectively. You can read more here. 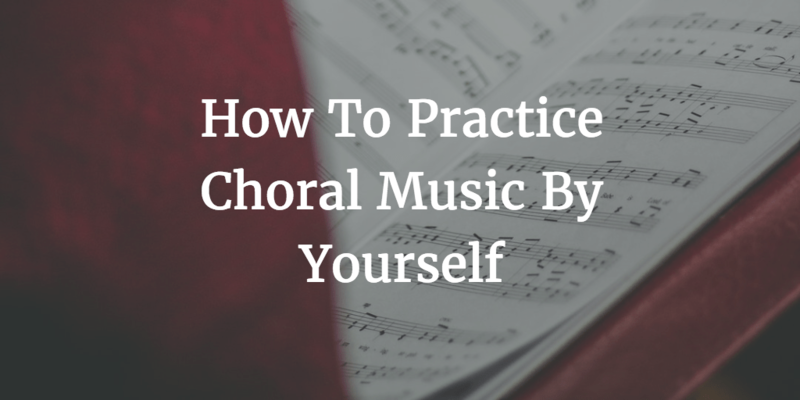 What are some other tips for practicing choral music by yourself? Tell us in the comments below!